In computer-supported collaborative learning (CSCL) environments, it is often observed that learners' collaboration processes are suboptimal in at least two aspects: First, learners often experience problems concerning acting in CSCL environments, e.g., how to establish smooth coordination and communication in an environment that is quite often new and unfamiliar to the learners. Secondly, similar to collaborative learning in face-to-face settings, learners often fail to engage in "higher-order" learning like explaining complex issues or monitoring one's own learning processes. A promising way to deal with these problems is to provide learners with scripts that support them both in communication/coordination and in higher-order learning. In this book, the term "script" is approached from at least three perspectives: cognitive psychology perspective, computer science perspective, and an educational perspective. Research on Computer-Supported Collaborative Learning (CSCL) is a multidisciplinary field located at the intersection of cognitive psychology, computer science, and education. Yet, the different epistemological and theoretical backgrounds of these disciplines often make fruitful exchange between them difficult. CSCL urgently needs to develop and use boundary concepts that can bring these fields closer together to improve cumulative research and development of computer-supported learning environments. Scripting Computer-Supported Collaborative Learning focuses on one term with the potential to become a real boundary concept in CSCL—"scripting". Scripting Computer-Supported Collaborative Learning, which has collected advanced script approaches, demonstrates the opportunities for using synergy to apply the script concept between perspectives and interdisciplinary CSCL approaches to scripting. 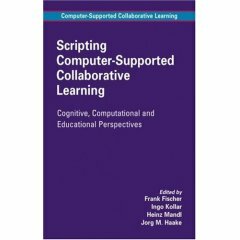 This volume represents the state of the art of research on scripting computer-supported collaborative learning and provides a starting point for the development of a common understanding of scripting in CSCL. Research on collaboration scripts has an extraordinary potential for advancing the multidisciplinary endeavor of CSCL research and this book provides a rich basis for further exploring and realizing this potential. As such, it will be a valuable resource for research, development, and teaching. Beat war Co-Leiter des ICT-Kompetenzzentrums TOP während er Dieses Buch ins Biblionetz aufgenommen hat. Die bisher letzte Bearbeitung erfolgte während seiner Zeit am Institut für Medien und Schule. Beat besitzt kein physisches, aber ein digitales Exemplar. (das er aber aus Urheberrechtsgründen nicht einfach weitergeben darf). Aufgrund der vielen Verknüpfungen im Biblionetz scheint er sich intensiver damit befasst zu haben. Beat hat Dieses Buch auch schon in Blogpostings erwähnt.